Watercare to invest $4.9 billion in Auckland’s future. Hunua 4 ambassador Christine Murray with Athens Rd resident Hannah Taylor and sons Hamish and Tom. Watercare says strategic stakeholder engagement is key to its water and wastewater project management plans. The pressure is on Watercare to deliver massive infrastructure projects in the midst of Auckland communities. But a fresh, inclusive approach will soften their impact on customers. Auckland’s population is forecast to grow by up to one million people over the next 30 years. That’s equivalent to adding the population of Tauranga to the region every three years. This growth will nearly double the number of properties connected to the metropolitan water and wastewater networks as Auckland Council plans for significant housing intensification in existing urban areas as well as expansion of satellite towns. As a council-controlled organisation responsible for giving effect to council plans, Watercare’s latest long-term asset management plan – released in July – specifies a 10-year investment of $4.9 billion in upgrading and expanding infrastructure to provide capacity for a further 195,000 connections. Dozens of major and minor projects are underway at any one time. And they are worthy of public attention for good reasons: works are paid for by a combination of water service charges, borrowing and infrastructure growth charges; and much of the building of pipelines and tunnels takes place in roads and reserves near homes and businesses, with the potential to disrupt access and travel. On costs, Watercare says it aims to deliver projects in a prudent and cost-efficient manner and reports that since it took over regional responsibility for water and wastewater services in 2010, it has saved $100 million a year on what the former local authority providers forecast. 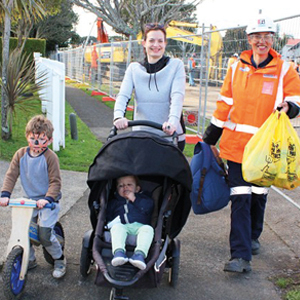 Teaching children, weeding gardens, carrying shopping for residents and guarding their cars… these are some of the off-the-ball duties carried out by the team laying a giant pipeline through Auckland’s urban heartland. Since 2008, Watercare has been building the $400 million Hunua 4 pipeline, which will stretch 32 kilometres from the water reservoirs in the south to those in the CBD. Until late 2014, the project had a low profile. But that had to change when the big diggers rolled into Mangere to install 1.9 metre diameter pipes – in the road. A community began to question the disruption to their commuter and school run and blocked driveways. Contractor Fulton Hogan / John Holland joint venture had a dedicated project email and helpline manned 24 hours a day to give up-to-date information, and stakeholder liaison managers. But Watercare project manager David Moore says a lesson was learned: public information had not sufficiently spelled out the scale of the project and why it was needed; there was a need for quality and timely information to the people directly affected. As the trenching moved to the busy roads of Onehunga and One Tree Hill, more disruption to people’s daily lives was anticipated. In response, a beefed up communications strategy supported a traffic management plan – warning commuters to steer clear of road closures and suggesting detours. It was a success. A project ambassador was appointed to help residents, who were without driveway access, to get their shopping and young children from the car, put out rubbish bins or bring in the Meals on Wheels. In schools, Watercare provided teaching support to explain the water cycle, the joint venture sponsored a photography competition; volunteers from the contractor and Watercare weeded and mulched a school’s garden; pupils toured the trench site and their posters described the diggers’ scoops, claws and rock hammers. And the “brave men” building the pipeline. Despite this minimum-cost approach to projects, increasingly, thought and energy goes into calming the waters ahead for project proposals. “My goal is for us to be a customer service company with infrastructure, not an infrastructure company with customers,” says Raveen Jaduram, who was appointed chief executive in November 2014. “To achieve this we need a new way of thinking. We want our employees to approach projects and planning from new and diverse perspectives. “One way we are doing this is by creating community consultative groups to involve local stakeholders in the planning and consenting process rather than informing them once consent is granted. Watercare has stakeholder liaison managers working alongside project managers on pre-consent processes as well as during construction. The RMA concept of developing the Best Practicable Option (BPO) is being achieved by Watercare’s dual aim to educate and address concerns. Face-to-face meetings with tangata whenua, community and environmental groups and residents, investigation of issues raised, and site “open days” with planners answering questions, are attempts to seek long-term outcomes that balance environmental, cultural, operational and economic factors. As a result of feedback from a community consultative group for the Omaha wastewater treatment plant in north-east Auckland, the consent application for discharge to the sensitive Whangateau Harbour was changed to include a five-yearly contamination risk assessment and reduced volume discharged. The pre-consent process for expanding the Pukekohe wastewater treatment plant resulted in consents being sought for a longer term outcome, which will rehabilitate a wetland and improve water quality in a Waikato River tributary. In south-west Auckland, Watercare also took a collaborative approach to consulting on options for a proposed wastewater plant at Waiuku to serve four growing communities, with a single point of discharge. The assurances on the high quality of the treated effluent raise the potential to lift water quality in the Waiuku River as well as alternative re-use of the discharge. As well as dealing with directly impacted parties, Watercare is telling people what projects are for. This establishes better understanding of where their water and wastewater charges go, and it shows how the company is responding to the growth in Auckland. Watercare intends to expand this, even into schools. In Glen Eden, it is teaching children about the benefits of a large wastewater storage tank being built in a local park and a pipeline along a main road. The children are drawing pictures of fish – in the environment that the project is trying to protect by reducing effluent overflows. One of the big lessons learned and one where Watercare is trying to improve is in the quality and timeliness of information, says its local boards and stakeholder engagement manager Brent Evans. He works with local body politicians ahead of the project, because it is they who will field enquiries from the public. “We show them the scale of the project and potential for disturbance and also say how we intend to work with people on the ground to give them confidence that we know what we are doing. “We make sure there are no surprises by working with people directly affected and getting them quality information in a timely manner. “A new initiative is around what we call ‘the voice of the customer’. Information that goes out on our website’s project pages, will have QR generator codes and links for people to tell us what they think we did well, or not so well. Projects bring progress and prosperity that everyone will benefit from but some residents do have to endure more disruption because of where the infrastructure is located. “Given the nature of our work, we cannot always eliminate disruption but we can reassure the public we are making every effort to minimise it,” says Raveen Jaduram. He says the benefits of effective stakeholder management are shown on Watercare’s Hunua 4 pipeline project, which is the biggest pipeline undertaken in New Zealand. Over four years, installation has passed 5000 properties and 19 schools, crossed the Manukau Harbour, railway lines, three motorways and six arterial roads – some carrying up to 35,000 vehicle movements daily. The Fulton Hogan / John Holland joint venture contractor says the project collaborates across many stakeholders, including local boards, iwi, government agencies, residents, businesses, schools, utility companies, subcontractors and third parties. It has tried to work around the problem of Auckland’s heavy traffic at sensitive spots by installing over weekends and public holidays and says it has achieved some significant works with minimal disruptions. Two stakeholder liaison advisors are on site to inform residents of progress and handle complaints. A fulltime ambassador is on site where access to driveways is restricted and helps residents to carry their shopping or deliver meals on wheels or courier packages.